During deployment, Fortifications are placed by each player in turn before all other units. Fortifications can be placed on the battle map in any hex that isn't adjacent to the objective. Fortifications don't count against stacking limits. 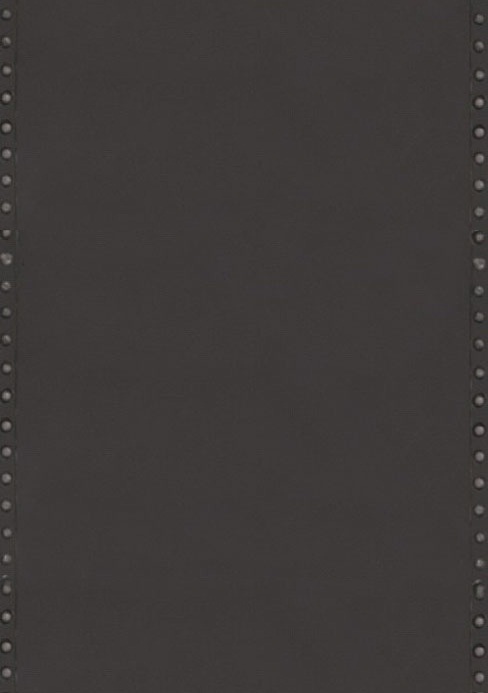 This Obstacle is placed along the boundary between hexes. A Soldier must make a successful movement roll to cross this Obstacle. Q: Do players alternate the placement of Fortifications or does one player place all of his first, then the second player? 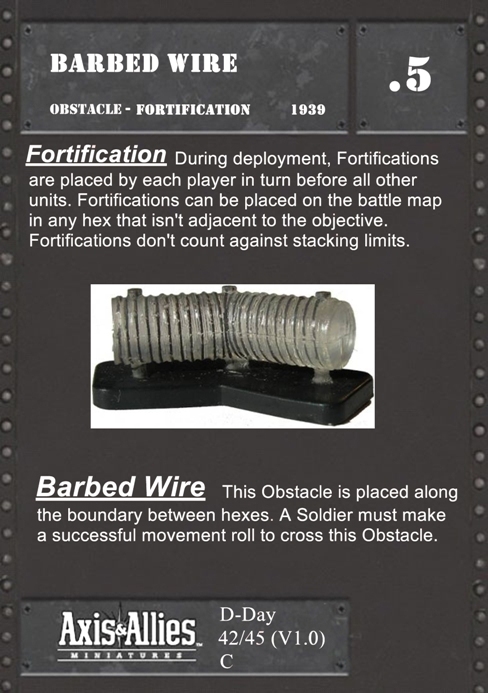 Fortifications are deployed before all other units, since they are fixed and obvious on the battlefield. Once the first player is determined after the initial coin flip, that player deploys all his Fortifications. Then the second player deploys all his Fortifications. After all Fortifications have been deployed, deploy units normally. From the 11/12/2009 Rules Update: Each individual Barbed Wire piece covers two adjoining hexsides, as shown below. Q: I'm not sure how you are allowed to place Barbed Wire around an objective. A: The diagram below shows the hex sides where Barbed Wire can be placed around the Objective. Q: I can't find the rules covering obstacles or fortifications like Barbed Wire. Where are they? What do they say? The Axis and Allies D-Day set introduces Obstacles to the battlefield. Obstacles belong to neither side, and can be deployed by the Axis or the Allies. Obstacles count toward your army's 100-point limit, and you have to show your opponent all the Obstacles in your army before you deploy them. Obstacles don't count against the normal stacking limits, but are limited to one per hex and one per hex edge. Obstacles can't move. Obstacles can't be placed in hexes adjacent to the objective or on hex edges that surround the hex that contains the objective. You can put a Barbed Wire on a hex edge that surrounds a hex that contains another obstacle, as long as that hex isn't the objective. There are two kinds of Obstacles - Fortifications and Traps. Since traps represent hazards that are hidden and not obvious, they aren't deployed during normal deployment. During your assault phase, you can place a Trap in any unoccupied hex that isn't adjacent to the objective.